If you are looking for developmentally appropriate training, you have found the right place. Players at Simply Soccer will be schooled in the four components of soccer – technical, tactical, psychological and fitness. The training is based on the characteristics of the players for a specific age group and the various stages of their psychomotor, cognitive and psychosocial development are taken into account. For example, a U-6 player’s cognitive development is still relatively primitive. Their play consists of a lot of imagination or pretend activities. They are beginning to use symbols or sounds to represent objects in an environment. The U-12 player, on the other hand, is beginning to think in abstract terms and can address hypothetical situations. So both groups’ needs are addressed and although we will follow the same basic camp philosophy, players must be given different activities to appropriately develop. After each camp, players are given an evaluation as to how they performed during the week. The players are given a written evaluation as to their areas of strength and weakness. This is to serve as a guide as to where the player currently performs and what is needed to continue in their development. Camp participants will be trained in a technical skill during the morning session. Each day is devoted to a particular skill: Monday, for example, is dedicated to dribbling. The day follows that “theme” including the various “games” we play during the morning session. The camp participants then have lunch, watch videos of soccer matches, greatest goals or an appropriate Disney movie before getting refreshed at the pool. They then return to the fields for “World Cup” matches in the afternoon. The final day is devoted to our World Cup tournament. Players are divided into equal teams and then compete for prizes. It always provides for some spirited competition. There are also camper/coach matches – one for the younger players and one for the older players in the camp. 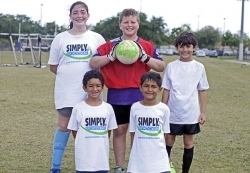 At the end of the day, players are given their written evaluations; a certificate and then they get autographs from fellow campers on their Simply Soccer T-Shirts. We at Simply Soccer pride ourselves in the numbers of players we have at the camps and number of return participants that we get each year.